This road trip blog series wasn’t supposed to be this long, but Part Two had too much animal cuteness to include baseball as well. 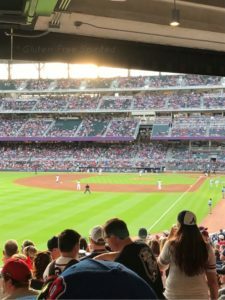 I ended up saving the best for last as Opening Weekend at SunTrust Park was the whole reason I planned the trip in the first place. 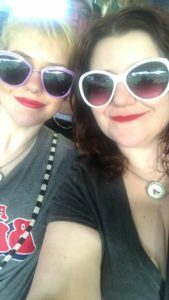 Unfortunately, I wasn’t able to get tickets to Opening Night (as discussed in Part One), so we made Saturday a spectacular day of two of my favorite things: pandas & baseball. We spent a little bit longer at Zoo Atlanta than we meant too, so we got back to our hotel late. After freshening up and pre-gaming, we finally headed to the ballpark around 6:15. This Drury location is just 2 exits from SunTrust Park. The drive didn’t take us long at all & our friends bought a parking pass prior to the game. It took just a few minutes to walk from the lot to the ballpark. Third base entrance at our new home. By the time we got into the ballpark, the National Anthem was about to start. We quickly made our way to our seats. We were greeted with a great view of the beautiful field of our new home. Many of our friends were at this game, so we left our seats in the second inning to meet up with one friend. That quickly multiplied to two more. More and more friends came down to for pictures and conversation. We did see a majority of the game where we gathered in a large group. 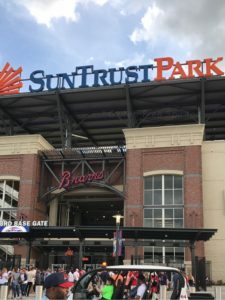 SunTrust Park has many food options, including both vegetarian and gluten-free. 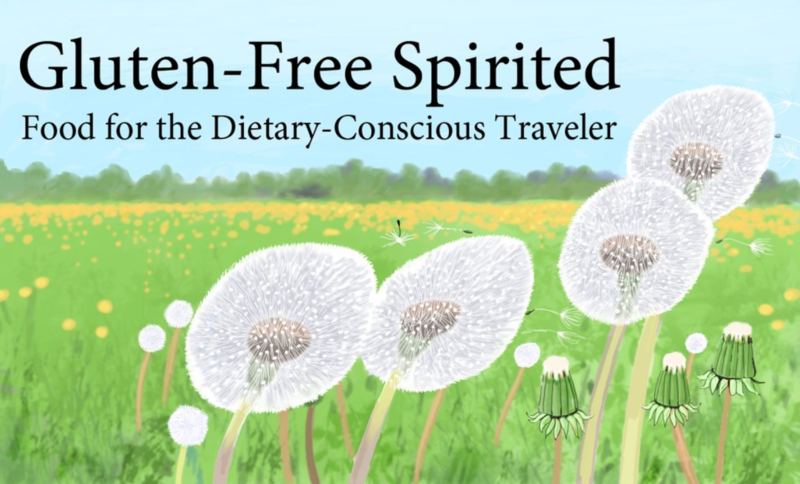 In Section 148, the dietary-conscious traveler will find a Field of Greens. This stand has veggie dogs and burgers, salad, fruit and veggie cups, and gluten-free beer. 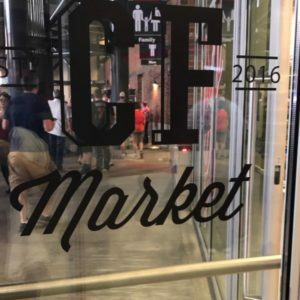 The Centerfield Market is one section over. 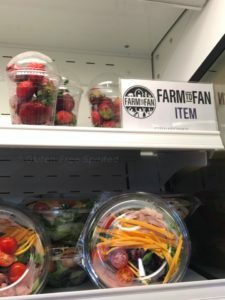 There are a variety of food options such as gluten-free hot dogs, Minute Maid frozen lemonade and raspberry (it’s also soy-free), Enjoy Life Gluten-Free snacks, Fresh-to-Farm fruit, fruit and veggie cups, and the ballpark favorite, Cracker Jacks. The door to dietary-conscious traveler’s haven. 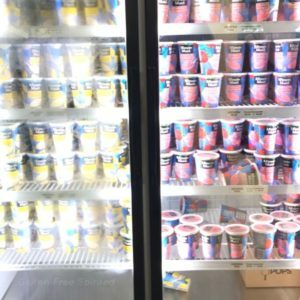 Frozen lemonade and raspberry Minute Maid for all those hot nights at the ballpark. 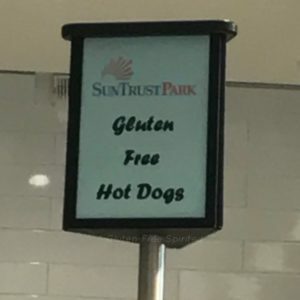 As you can see, SunTrust Park has a lot of options for those with dietary restrictions. 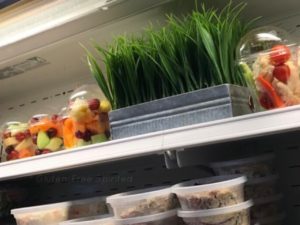 If you don’t feel like any of these options will work for you, fans are allowed to bring in clear, one gallon containers with the food of their choice. Sealed water bottles are also allowed. One bag of food and bottle of water are allowed per ticketholder. 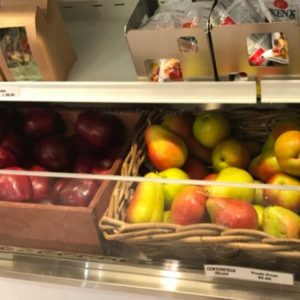 Be aware that these items are subject to additional inspection. Surrounding the ballpark is The Battery Atlanta which includes place to eat and a music venue. Wahlburger’s is located in The Battery and does have gluten-free menu items. We plan to make a visit on our next trip in June. After the game, we got word to head to the plaza in The Battery for a surprise. We arrived just in time for a surprise T.I. concert! T.I. performed about five songs. After the performance, we happened to spot former Braves player (he was traded to the Red Sox about 2 weeks after this photo was taken) Chase D’Arnaud. He was kind enough to pose for photos and his mom was the one who snapped the photo for us. 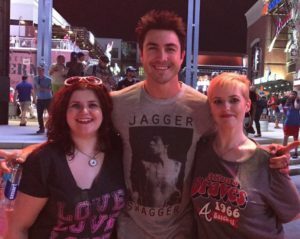 He was very nice and took photos with our group as well. It was a wonderful trip with a lot jam-packed into one weekend! Looking forward to our trip next month! If you’re not already, follow Gluten-Free Spirited on Instagram for more pictures from our Easter weekend Road Trip. Good, you enjoyed the trip, hope you enjoyed the game as well. I did enjoy the game as well. Really looking forward to going back in a month. wow, loved reading this 🙂 happy trip !